THE first concrete signs of post-Brexit financial stress in Britain emerged this week. The asset-management arm of Standard Life, an insurer, suspended redemptions from its £2.9 billion ($3.8 billion) British property fund. It was followed by a flurry of rivals: Aviva, Canada Life, Columbia Threadneedle, Henderson and M&G. Another fund, run by Aberdeen, said it would apply a 17% discount to redemptions. The decisions highlighted the mismatch between the open-ended nature of such funds—allowing retail investors to buy and sell on a daily basis—and the illiquid assets they hold: office blocks and shopping centres. But the announcements also reflected the shock to the property market caused by the Brexit vote. London has attracted lots of businesses both because of its perceived openness and because it provides an English-speaking base for doing business in the EU; the vote has caused a reassessment of its attractiveness as a corporate home. According to the Financial Times, German and Spanish buyers pulled out of £650m-worth of property deals in the week after the referendum. Russell Chaplin of Aberdeen says many deals had a “Brexit clause” allowing purchasers to walk away if Britain voted to leave. This has happened to Aberdeen’s property fund in two cases: one buyer abandoned a purchase altogether while another asked for a discount, which has not been accepted. Mutual property funds tend to have monthly valuations (conducted by outsiders) to determine the “fair value” of their assets. Given the uncertainties after the referendum, valuers thought it prudent to apply a discount and fund-management groups took their advice. Henderson reduced its fair-value estimate by 4%, M&G by 4.5%, and Standard Life by 5%. The funds keep some liquid assets on hand in order to meet the kind of redemptions they face in normal circumstances; as of May 31st, Standard Life had 13% of its assets in this form. 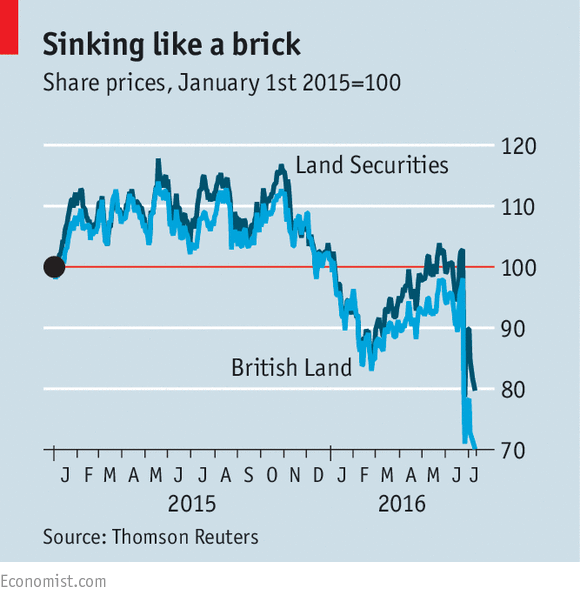 Some of these liquid assets will be stakes in big property companies like British Land and Land Securities, so the big falls in their share prices (see chart) may in part be a contagion effect from funds meeting redemption requests. There may be other knock-on effects. In a report on financial stability published on July 5th, the Bank of England worried that forced sales of assets by property funds may exacerbate the market’s weakness; it has eased capital requirements for banks to encourage lending. Problems have been growing for a while. The central bank said that foreign capital inflows into British property fell by almost 50% in the first quarter, perhaps as investors waited for the Brexit vote to be resolved. The purchasing managers’ index for the construction industry fell in June to its lowest level since 2009. Mike Prew of Jefferies, an investment bank, has been predicting a commercial-property downturn since last year. Two areas stand out. Central London has been on a building spree, with 26m square feet of offices currently being added (or refurbished) in a market with around 200m square feet of space. Mr Prew thinks 100,000 jobs in London are at risk of moving to the EU—enough to free up 10m square feet. Office rents could fall by as much as 18% in central London, he warns. The second problem area is retail premises, to which the Standard Life fund was heavily exposed (its five biggest tenants were all retailers). High-street shops have been squeezed by the rise of the internet; BHS, a department-store chain, recently went under. If the economy does slow in the wake of the referendum, retailers’ troubles will intensify. Comparisons with the financial crisis of 2007-08 are inevitable; that too saw property-fund suspensions in its early stages. But they should not be overdone. For a start, open-ended property funds do not borrow and own only around 5% of British commercial property. Few investors are likely to have devoted a large part of their savings to this asset; they will have known that they might lose money. The systemic risk is limited. Furthermore, with interest rates near zero and ten-year bond yields below 1%, property funds still offer a decent income; even in London, prime rental yields are 4-4.5%. Vacancies are below the historical average, according to Jones Lang LaSalle, an estate agent. A big sell-off would surely attract some bargain-hunters. Still, fund suspensions are not a good sign. At the very least, they should make regulators question whether open-ended funds are suitable for property investing. There is nothing liquid about bricks.